Sound Division Group have completed a complex sound installation for a sophisticated, new-age bowling and leisure concept, set within a landmark London building. Brothers Charles and Adam Breeden had originally contracted the technology specialists to fit out their award-winning Lonsdale in Notting Hill exactly three years ago. So when they set out to plan All Star Lanes, within the regenerated Victoria House on Bloomsbury Square, the Breedens (in partnership with Mark von Westenholz) had no hesitation in returning to David Graham’s company. Central to that team were the project managers — installation contractor Jon Carey, responsible for masterminding most of the company’s fit-outs, and freelance sound designer Ed Manwaring, working alongside the Sound Division team. The company has produced an intelligent four-zone system based around a JBL/BSS Soundweb solution. This ensures that the hard disc-generated background sound is distributed evenly throughout the Private Bowling Lounge, Reception Area, Main Lanes & Diner and finally the sophisticated Cocktail Bar. JBL Control 29AV's reproduce the mid high frequencies above each of the four main lanes, boosted by a single JBL AL6125 2x15in sub, with a pair of JBL Control 28's at the rear of the room. In the small, two-lane private hire room there are a further five JBL Control 29AV's. The Diner forms part of the general concourse and local coverage is provided by eight JBL Control 25AV's. 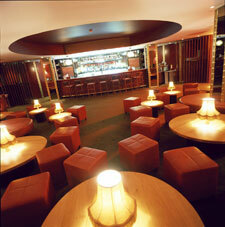 In the separate Cocktail Bar — forged into what was once heavily reinforced bank vaults — are six further Control 29AV's. Completing the array are Control 25AV's in the Reception area, while Control 24c Micro ceiling speakers deliver to the most important rooms in the house! The system is powered throughout by Crown XS and XLS Series amplification. What sets this installation apart, however, is its sophisticated signal processing and levels of controllability. Having produced the acoustic site documents in Stardraw (as well as the Soundweb DSP files), Manwaring and Sound Division specified a line-configured BSS SW9088iiLL and SW9008 breakout device — providing them with eight extra outputs — and set up control stations via an 9010 ‘Jellyfish’ (main touch panel controller) and three 9011 ‘Shrimp’ wall plates (positioned in the Private Room, Reception and Cocktail Bars). All the other areas, including the toilets, are run off the ‘Jellyfish’. But Sound Division also made the inspired decision to supply a BSS SW9016 video/audio matrix switcher — which handles the additional mono and stereo inputs that are beyond the capacity of a single 9088, as well as the video switching from the DVD/VCR playback sources on the Jellyfish. Featuring eight broadcast-quality composite video inputs the SW9016 is capable of routing multiple video signals to several zones, all within the control of the Soundweb architecture. 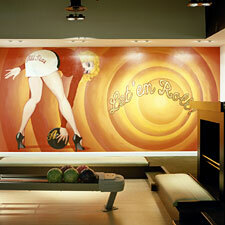 This will form the hub of All Star Lanes’ expanding video facility, when strategically placed monitors come into play. Finally, for higher profile occasions, Sound Division have equipped a dedicated state-of-the-art DJ booth, positioned at the side of the main lanes, with a pair of Technics SL1210 Mk5’s, Pioneer CDJ 1000 CD decks, Allen & Heath XONE:62 mixer (and powered EON G2 for DJ monitoring). 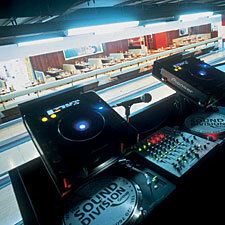 They also made a provision for DJ plug-in points in the Cocktail Bar and Private Bowling Alley. 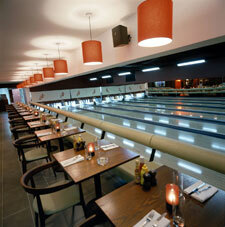 And so All Star Lanes looks set to revolutionise the bowling industry in Britain. With so much attention paid to the drinking and dining aspects — as part of the overall entertainment experience — the operating team envisages that the bar and restaurant will become destinations in their own right. The catering has been masterminded by celebrated bar consultant, Henry Besant, who has created an authentic American drinking and dining experience — in fact the bar uses a liquor product list that is almost entirely American, still a rarity in London. As for the Diner, this will serve both the players at their lanes and spectators with a simple and elegant menu of American brasserie dishes.